Nicki Thiim took his maiden Supercup crown amid the stunning backdrop of the Yas Marina track. Danish driver, Nicki Thiim has won the 2013 Porsche Mobil 1 Supercup championship after dominating the final two rounds of the year in Abu Dhabi. Thiim won both races at the Yas Marina circuit to secure the crown. The final meeting of the 2013 Porsche Mobil 1 Supercup season would see the competitors battle it out in two 22-lap races. However, erstwhile championship leader, Sean Edwards would not be among them after his death in a tragic accident in October. This left the way open for Thiim to secure his first Supercup crown in just his second full season racing a Porsche 911 GT3 Cup in the F1 support series. In his first Supercup race, Earl Bamber showed himself as a star of the future. In qualifying, it was not Thiim who was the star of the show though. Recently crowned Porsche Carrera Cup Asia champion, Earl Bamber, making a guest appearance with the FACH AUTO TECH team, put in a stunning lap to take pole position for race one. In his first race in the 991-type GT3 Cup, the New Zealander made a good start to lead Thiim into the first corner. For the next 21 laps, Bamber led the way, as Thiim made sure that he kept the leader in check. Finally, on the last lap, Thiim’s pressure paid off, as a small error from Bamber allowed the Dane to sneak through and take 0.7 second victory and with it an almost unassailable lead in the championship fight. It was an emotional win for Thiim in the first race since the death of his friend, Sean Edwards. “I stayed behind Earl and waited for him to make a mistake, which he then did with deteriorating tyres”, explained Thiim. Despite losing out on a sensational Supercup win on his debut, Bamber was pleased with his showing. “If someone had told me when I arrived in Abu Dhabi that I would be second here, I’d have said they were crazy”, said the Kiwi. Behind the lead battle, Kuba Giermaziak finished third as Total 911’s ‘one to watch’, Ben Barker took a career best fourth place for Team Bleekemolen. Ben Barker found the Abu Dhabi circuit to his liking, taking his best finish of the season in fourth. The British driver briefly found himself ahead of his Hungarian rival. However, Barker had to cede the position after being judged to have exceeded track limits during the overtake. Kévin Estre, the 2013 Porsche Carrera Cup Deutschland champion, finished just a few tenths of a second behind Barker’s 911, while Michael Ammermüller’s title hopes all but disappeared with a sixth-place finish. 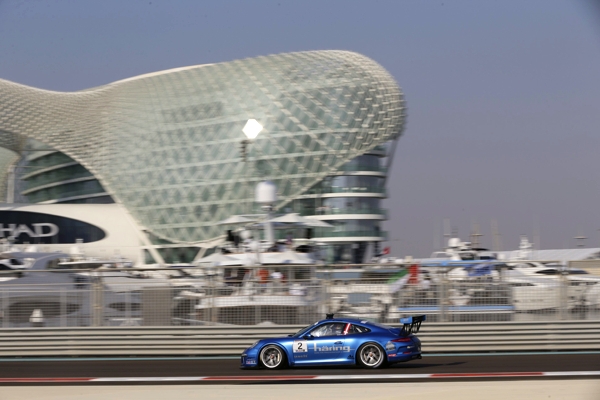 The final race of the 2013 Porsche Mobil 1 Supercup season saw Thiim put in a champion’s drive, as the Dane took off from pole to take a commanding win around the Yas Marina track. Thiim showed the way in the second encounter, displaying the class of a champion. Thiim proved to be the class of the field, eventually taking the chequered flag 6.2 seconds ahead of his nearest rival, Estre. “It was a very emotional weekend for us all”, said the new champion. “I did everything I could to show that I deserved the overall win. Estre was similar focussed of honouring Edwards’ memory. “We gave the fans a great weekend with fair racing, and I think that’s what Sean would have wanted”, explained the Frenchman. Kévin Estre finished the Supercup season on a high after winning the Carrera Cup Deutschland. In third place, Jeroen Bleekemolen took his best finish of the year, and his first Supercup podium since Hungary in 2011. The 32-year-old racer has shown great resilience during a tough campaign. Richie Stanaway beat his compatriot Bamber to fourth place, as Giermaziak rounded off his season with sixth in Abu Dhabi. Barker, having to start 11th after a red flag in qualifying, managed to work his way into the points, with his ninth place securing the Briton tenth in the final points standings, and third in the Rookie Classification.